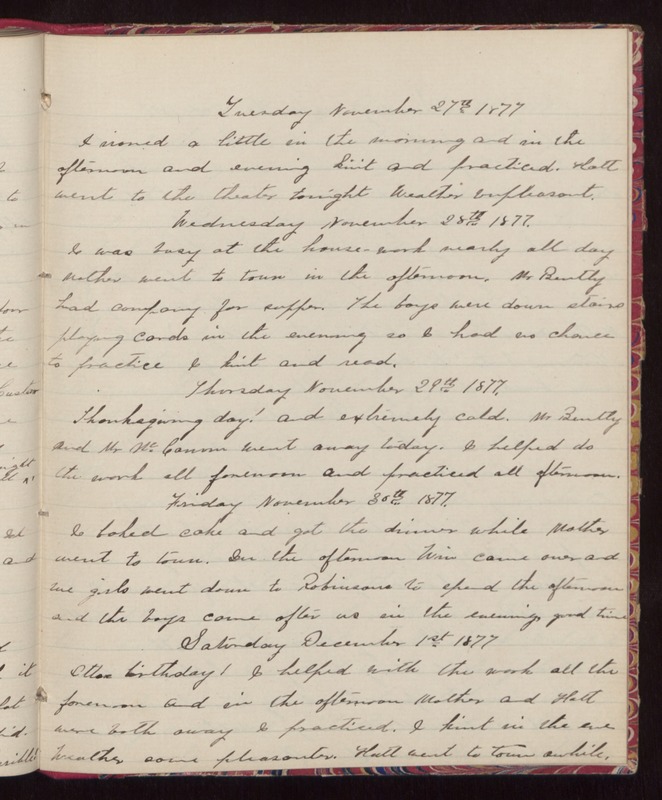 Tuesday November 27th 1877 I ironed a little in the morning and in the afternoon and evening knit and practiced. Hatt went to the theater tonight Weather unpleasant. Wednesday November 28th 1877. I was busy at the house-work nearly all day Mother went to town in the afternoon. Mr Bently had company for supper. The boys were down stairs playing cards in the evening so I had no chance to practice I knit and read. Thursday November 29th 1877. Thanksgiving day! and extremely cold. Mr Bently and Mr Mc[Cann?] went away today. I helped do the work all forenoon and practiced all afternoon. Friday November 30th 1877. I baked cake and got the dinner while Mother went to town. In the afternoon Win came over and we girls went down to Robinsons to spend the afternoon and the boys came after us in the evening, good time. Sunday December 1st 1877 Ottos birthday! I helped with the work all the forenoon and in the afternoon Mother and Hatt were both away I practiced. I knit in the eve Weather some pleasanter. Hatt went to town awhile.